Definition: A 3 Phase rectifier is a device which rectifies the input AC voltage with the use of 3 phase transformer and 3 diodes which are connected to each of the three phases of transformer secondary winding. A single phase rectifier also rectifies i.e. converts AC supply to DC supply but uses only single phase of transformer secondary coil for the conversion. And the diodes are connected to the secondary winding of single phase transformer. The drawback of this arrangement is high ripple factor. In case of half wave rectifier the ripple factor is 1.21 and in case of full wave rectifier the ripple factor is 0.482. In both the cases the value of ripple factor cannot be neglected. 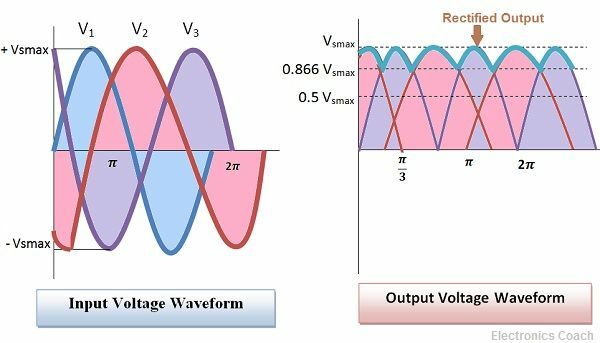 While in case of half wave rectifier the value is quite large but in full wave rectifier too the value of rectifier is significantly large. Thus, in such types of arrangement we need smoothing circuit in order to remove these ripples. These ripples are the AC components in the DC voltage. This is called pulsating DC voltage. If this pulsating DC voltage is used in several applications it lead to poor performance of the device. Thus, the Smoothing circuit is used, filter works as a smoothing circuit for rectifier system. But after this smoothing process the rectifier voltage falls to zero at some point. Therefore, if in place of single phase transformer we use three phase transformer the ripple factor can be reduced up to a large extent. One of the significant advantage of three phase transformer is that the rectified voltage do not falls to zero even when no smoothing arrangement is used. In three phase half wave rectifier, three diodes are connected to each of the three phase of secondary winding of the transformer. The three phases of secondary are connected in the form of star thus it is also called Star Connected Secondary. The anode terminal of the diode is connected to the secondary winding of the transformer. And the three phases of the transformer is connected together at a common point called neutral. This neutral point provides the negative terminal to the load and is earthed. Each diodes conducts for one third of the AC cycle and remaining two diodes will remains open circuit. The ouput DC voltage will be between the peak value of supply voltage and half of the supply voltage. 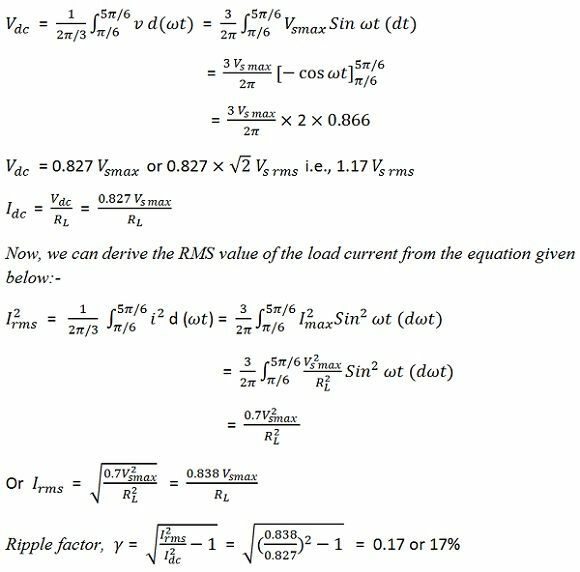 The ripple factor for 3 phase half wave rectifier is derived in the equations below. It is evident from the above calculations that the ripple factor for the 3 phase half wave rectifier is 0.17 i.e. 17%. In single phase half have rectifier the value of ripple factor is 1.21 and in case of single phase full wave rectifier it is 0.482. 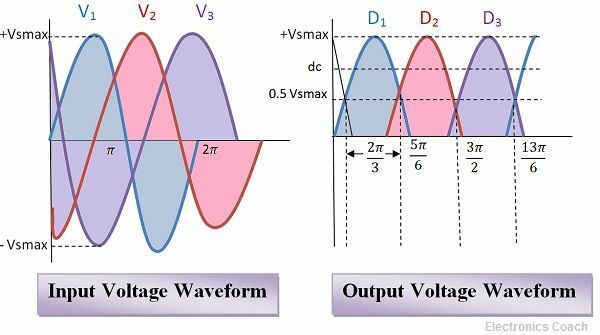 Thus, it is evident that the value of ripple factor in 3 phase rectifier is very less in comparison to single phase rectifier. Moreover, the frequency of the ripples in three phase rectifier is very high. Thus, due to this these ripples can be easily filtered. The ripple frequency in case of three phase rectifiers is three times of the supply frequency. Due to this smoothing process is very easy in case of three phase rectifier than that of single phase rectifier. In three phase full wave rectifier six diodes are used. It is also called 6-diode half wave rectifier. In this each diode conducts for 1/6th part of the AC cycle. The output DC voltage fluctuations are less in 3 phase full wave rectifiers. The output voltage fluctuates between maximum value of peak voltage i.e Vsmax and 86.6% of the maximum voltage. 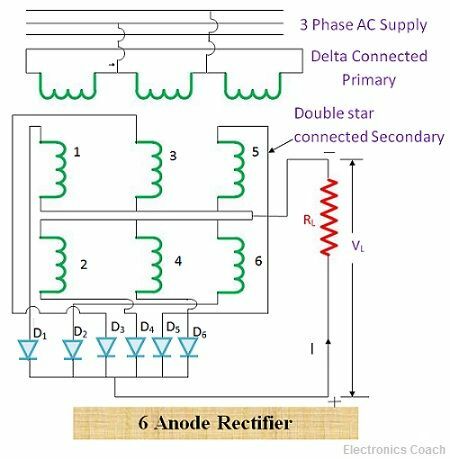 The advantage of 3 phase full wave rectifiers is that the output voltage is regulated and do not falls to zero. The output voltage is maintained between 86.6% of the maximum voltage and the peak value of the voltage. Thus, it appears regulated. The main reason behind this low fluctuation in output voltage is the usage of large number of diodes. It is appropriate to use 6 diodes. This is because if more than 6 diodes are used the cost of the circuit increases. Moreover, the circuit complexity increases and no significant increase in the regulation in the output voltage will be there. The type of arrangement in bridge form is widely used because there is no need of centre tap transformer in bridge rectifier. 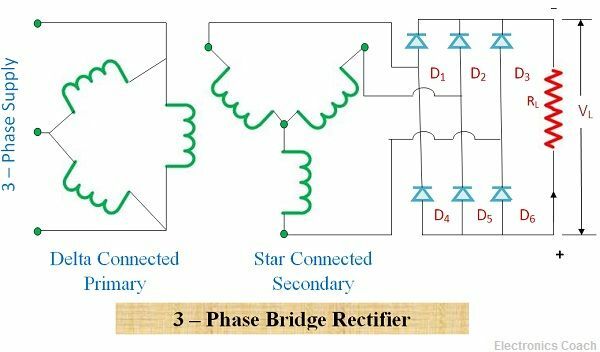 The advantage of using bridge rectifier is that the load current Idc is 0.95 times of the peak current flowing through the diode. The Vdc is approximately 2.34 times of the rms value of AC voltage through the secondary winding of transformer in 3 phase half eave rectifier. Each diode in 3 phase bridge rectifier carries only 1/3 of the current flowing though the load. They are used to overcome the shortcomings of single-phase rectifier. We have already discussed that single-phase rectifiers possess high ripple factor and high fluctuation in DC output. In order to overcome this drawback, 3 phase transformers came into existence.